This is the third in a series of posts about a new (and super-effective) approach to looking for work. Read the first post here and the second here. Those of you who have already taken my resume course may be tempted to skip this post (although I hope you won’t! ), but for everyone else, this is one of the most important changes you can make to the way you are currently looking for work. If your resume is compelling, engaging, and highly targeted towards your ideal companies and positions, you will get interviews. It’s as simple as that. I was told by my bosses that due to tough business times, I might be laid off. 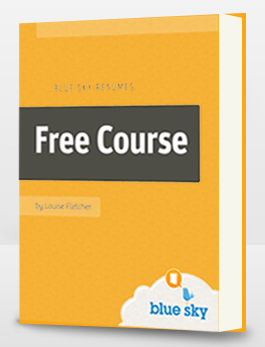 At that time, I found Blue Sky Resume’s, bought the downloadable book and poured through the exercises, creating what I felt was a true representation of who I am as a person and as an employee. I had an interview several days ago at a thriving, dynamic business in Seattle. Near the end of the interview (by two people), the gal in charge asked if she could sidetrack for a minute. It was at that point, she GUSHED about how fabulous she thought my résumé was…. after reading the first page, she said she couldn’t wait to get to the second page and find out more! She mentioned it was the best résumé she had read in years and years and years and felt that she knew my personality before I walked in the door! I get emails like that all the time but I’m not telling you this to toot my own horn. I shared this email because I wanted you to get a sense of how it feels to crack the resume problem and develop a document that truly strikes a chord with employers. If you would like to get that kind of reaction to your resume, you need to scrap the traditional career history document and instead create a highly targeted and compelling resume. For this, I have an easy 3-step process. Because you have already defined the type of position you want, and the type of company you want to work for, you can now dig deeper and identify what is important to people who hire for these positions. For example, if you’re targeting Apple, you know that an entrepreneurial spirit and a creative mindset will be vital. Beyond that, depending on the position, they will be looking for specific skills and experiences – think about what those are and make a list. The headline on our website’s home page says “you’re not cookie cutter.” That resonates because it’s true – you’re unlike everyone else currently looking for work in your field. No one has the same sets of skills, experiences and personality traits as you do, and yet if I looked at your resume, I bet I’d never know it, because most people’s resumes simply don’t communicate who they really are. Your job now is to determine what your unique value is to your target employers, bearing in mind what you already know about their needs. Now rewrite your resume so that it communicates exactly how you fit with your target employers. What skills do you have that they need? What personality traits are important to them? Which of your experiences are most illustrative of how you could help them? It’s important to keep a strict focus – if you achieved something great in the past, but it doesn’t relate to what you want to do now, leave it out. I know it’s hard, but focus is key to success. Describing the three steps in detail is beyond the scope of one blog post, so I’ve created a free email course that covers all of this in much more detail. If you haven’t already taken it, sign up here. Next time, I’ll be talking about how the Internet has revolutionized the job search process, and how you can use free and easy tools to set yourself apart in a crowded job market. Don’t miss it! (If you’re not already subscribed to my email list, sign up here and get an email every time a new post goes up).